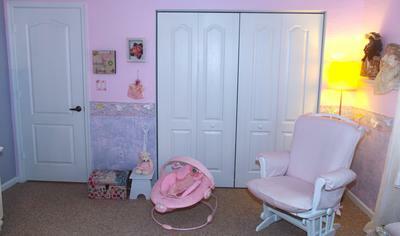 Izabella's beautiful princess nursery room has a wall border hand-painted by her mom. I made the nursery window valance and drapes myself. Our baby girl's nursery closet features pretty bins and baskets to use for storage. All of the crafts ideas and butterfly princess baby dream nursery ideas are my own. The design was not copied from a decorating book or taken from a picture that was taken of another baby's room that I saw in a magazine. Even the crib set is my own original design. I did receive inspiration from various examples that I picked up online including the crib crown and drapes. To pass it forward, I am going to share my shopping resources as well as paint colors in hopes that this information will help another mom-to-be. What brand and paint paint color did you use? We chose to paint the walls using the Glidden brand in colors called: Sweet Baby Girl, Moonlight Gray and Water Chestnut. Could you please describe the special painting techniques that we see in your baby girl nursery pictures. The hand-painted border with the green leaves was done using Glidden's Water Chestnut paint. I added iridescent beads on one end and pink ribbon trim on the other and some lovely "pop-out" butterflies in beautiful colors that I bought from Michaels Craft Store. Where did you find your baby's princess crib and what brand is it? The Issi crib was purchased from Babies R Us. It is included in the Classic White Mon Cheri Nursery Furniture Collection that we chose to use for the room. Could you please describe the custom, princess baby bedding set and tell our visitors where you found it? The crib set that we bought from an Ebay vendor is white with girly, pink ribbon trim. We would also like more details regarding where you found your nursery curtains, nursery lighting, area rugs, wall decorations and accessories. Did you buy everything or make them yourself? 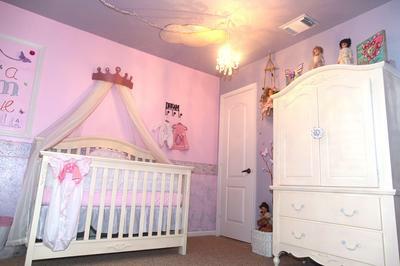 The decorations truly set the tone of the butterfly princess baby dream nursery. In keeping with the theme, most of the accessories have butterfly theme details. How do you store and organize all of your baby girl's clothes, toys and necessities? I chose decorative baskets and bins that complement our princess nursery's style and color scheme for storage. How long did it take you to design and decorate the room? Would you say that the project was easy, fun or a bit of a challenge? What was your favorite part of the decorative process? The entire project took me roughly 4 days to complete. It was all fun and easy enough for me to manage. My favorite part was painting the details on the walls of the room. Did you paint and decorate the entire nursery yourself or did you have help? If you had help, who was your helper and what was their contribution? I did everything by myself other than applying the base coat of paint on the walls and ceiling. My husband, Carl, helped with that. What is your favorite part of your baby girl's nursery now that it's decorated? I love everything but after everything is done, seeing her name on the wall makes me love it even more. I hope that everyone that visits Unique Baby Gear Ideas likes my little princess' dream room. The colors of the butterflies along with the butterfly theme blend well with a princess theme and the combination is much more interesting than either standing alone. Great job! Your baby girl's room is lovely. Where did you get the crown for the canopy? Join in and write your own page! It's easy to do. How? 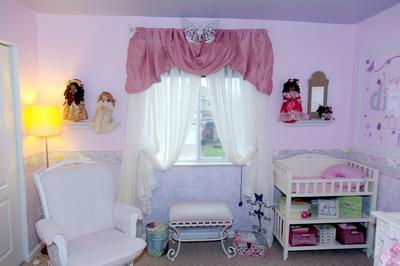 Simply click here to return to PRINCESS NURSERY IDEAS.